Hoppers attach directly to the skid-steer quick attach making it easy to place empty hoppers where they are needed on construction and demolition sites. When the hopper is full simply hook into it with the skid steer, transport it and dump it in a roll off dumpster, on trash pile etc.. Perfect for Landscape contractors. Fill the hoppers at the yard with stone or mulch and load them onto the truck or trailer for delivery. At the jobsite a skid-steer can pick the loaded hoppers off the truck and dumps the material right where it is needed in the landscape. 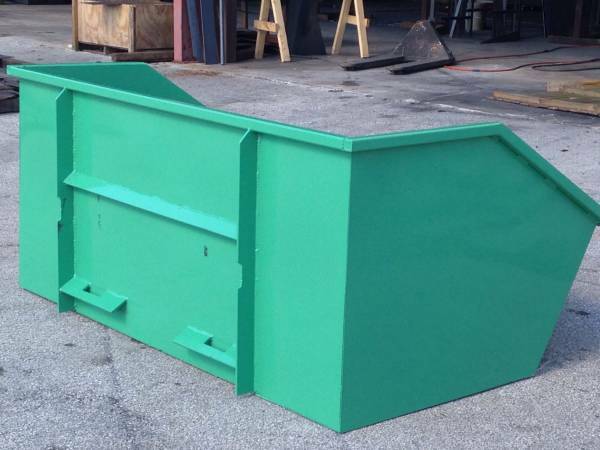 This is an efficient method for getting material from the yard to the jobsite placement area with minimal re handling, less material loss, and fewer costs.